After a lifetime of playing, teaching and performing, this recording contains some of my favourite music and great deal of self indulgence, including tunes for all of my four grandchildren. Thanks to my friend and colleague, Jim Ferguson for the fiddle tracks and to all my students from whom I have learned so much! Caol Muile is an ancient tune traditionally associated with St Columba and the monks of lona. Noted from the singing of Marion Macleod on the island of Eigg, The Cockle Gatherer is adapted from Marjory Kennedy-Fraser’s version, published in volume 3 of her Songs of the Hebrides. These words by Robert Burns convey the anger of a young girl that her wooer should be more interested in her dowry, or tocher, than her good looks! Despite the bitterness of the song it contains some of Burns’ finest poetry and was published in Johnson’s Musical Museum. This strong strathspey by the fiddler, Niel Gow, whom Bums greatly admired, was the poet’s first choice of tune for the words of his famous love song. The first three stanzas, as recorded here, were published with this melody in Johnson’s Musical Museum. This song mocks General John Cope whose Government forces were defeated by the Highland army of Bonnie Prince Charlie at the Battle of Prestonpans. The words are by Adam Skirving who was a tenant farmer at nearby Tranent and, presumably, an eye-witness whose word can be trusted when he tells us that General Cope was the first to flee from the battlefield. Written on the birth of my second grandson, Ewan Melville, this tune is in the style of a slow strathspey. The late James K Annand wrote and published some fine poetry in the Scots tongue. He wrote with skill and humour for children and here are four children’s rhymes which I have set for voice and harp. —	who is my granddaughter. Before farming became highly mechanised, harvest time meant neighbours and casual workers coming together in long hours of labour, followed by great celebrations. This was often an opportunity for young lads and lasses to meet and fall in love. While in Edinburgh, Robert Burns met and fell in love with Agnes (or Nancy) M’Lehose who was estranged from her abusive husband. They met comparatively few times, but exchanged many letters in which she was ‘Clarinda’ and he 'Sylvander'. Eventually they had to part when she sailed to Jamaica to try to mend her marriage and Burns wrote for her his famous song of parting, Ae Fond Kiss. His first choice of tune was Rory Dall’s Port, an ancient harp tune, as published inJohnsons’ Musical Museum. Other tunes, such the one sung here have since become more popular. The words of this song are often attributed toJean Adam, a school teacher who lived near Greenock in the first half of the 18th century. She must often have witnessed the excitement described in the song as Colin's ship is sighted approaching the harbour. All the family have to be dressed in their “Sunday best” clothes, shoes must shine, the house must be cleaned and then everybody rushes to the quay to see him land, because, as the title implies, nothing goes right while he is away! The origin of the tune is unknown. James K Annand made some wonderful translations of poems, such as this one, from the medieval Latin of Carmina Burana into Scots. The words of this song are by Agnes Mure Mackenzie. A native of Lewis, she missed its wide sky and open spaces when she went to Aberdeen University, but was constantly cheered by the neat and colourful front gardens in the city. Marjory Kennedy-Fraser matched the poem to a traditional Gaelic tune in her Songs of the Hebrides. The words of this hypnotic song in the Shetland dialect, warn fairies to keep away from the baby. Scottish fairies have been known to steal a child, leaving an ugly, ill-tempered changeling in its place! Burns’ words, known throughout the worid, are here sung to the beautiful tune which was his first choice, as published in Johnson's Musical Museum. * Jim Ferguson fiddle — arr. by Jim Ferguson and Isobel Mieras. 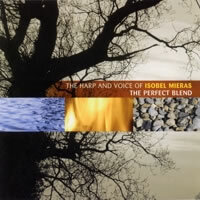 All arrangements of traditional material and onginal music are by Isobel Mieras unless otherwise acknowledged.